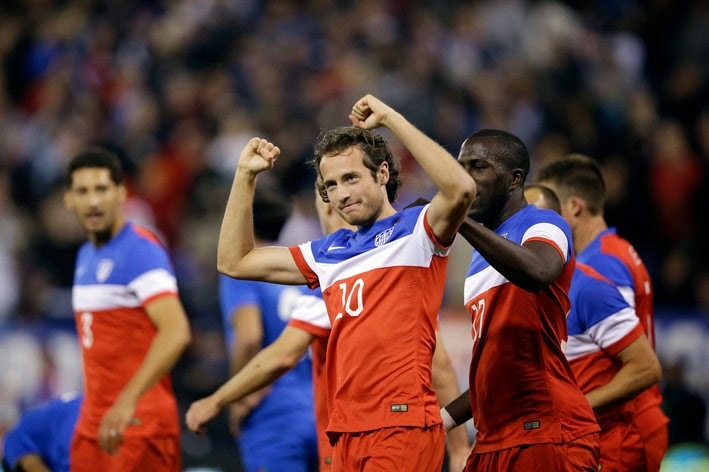 Mix Diskerud showed two things in last night's 2-0 USA win over Azerbaijan: he is a supersub and he can be a number 10. The number synonymous for so many years with Landon Donovan was given to Mix by Klinsmann as a message to the new generation of players: This is your team now. Diskerud has shown, repeatedly, that he can be counted on as a game-changer. He did so versus Russia in an impressive tie last year and then versus Mexico in the qualifier that clinched a place in Brazil for the US. In a perfect sequence versus Mexico, Diskerud skillfully lobbed the ball to himself at the edge of the area and provided the pass for Donovan's tally and the eventual "dos a cero." The back line continues reshuffling and this is worrisome. With Cameron moving ahead of Gonzalez at center back, Howard has to retrain and reconfigure his communication with his sentries. Fabian Johnson on the right could work but Beasley's inclusion, however just given his stellar record, is suspect versus the Group of Death opponents. There wasn't enough of Timmy Chandler last night. Would things have been different with Dempsey on the pitch? Possibly. Especially regarding the fact that he was set to start as second forward and in a preferred tandem with Altidore. How this affects forward-corps substitutions in the tournament will also be interesting to watch. Does Wondolowski remain the go-to sub? What about Johannsson's performance (and goal!). The wings also had an interesting, younger look to them with Zusi and Bedoya. Both performed well but their impact in a marquee game has yet to be seen with both as starters. The middle with Bradley and Jones is set and does not need tinkering.